New York, the summer of 2059, and the unbearable heat drives everyone to the very edge of madness. So when homicide lieutenant Eve Dallas is called to a violent attack by a deranged man, she thinks she's in control. She couldn't be more wrong. Someone is managing to spread insanity like a virus. There is no doubt in my mind that J. D. Robb writes great suspense. As well as that she writes about characters I like and care about, and she often gets me with an element of surprise, just when I think I have 'solved' this one. I was up there this time but was totally surprised/delighted to discover the way she brought the criminal down. In this book people are dying in a spectacular way, when their brain explodes. An email is sent by computer that invades their brain and after awhile they get raging headaches and go 'mad', sometimes they kill others as well as themselves. Who is behind this, that is the question and why. The why is soon very obvious but the who takes much longer. Because Eve is not very tech minded she needs Roarke and her tech team of Feeney and McNabb and young Jamie. Jamie we met in a previous book, his desire is to become a policeman like his murdered Grandad when he is old enough. He likes nothing better to trash talk with the tech guys, and he is a bit of a whizz kid when it comes to all things tech. I look forward to meeting him in later books. Troy Trueheart, a young policeman we met too earlier on has a small cameo role, and Eve finds it difficult to step back when he runs into trouble. She wants to 'mother' him. McNabb and Peabody have small but important parts in this story and I think their romance is certainly developing along the 'love' path. As usual the repartee between Eve and Peabody is great and now moving to a more 'equal' footing. Eve and Roarke clash a little over law and what is right, Eve thinks Roarke is on the opposite side of the fence to her but he just has a broader outlook and he helps her to see it. 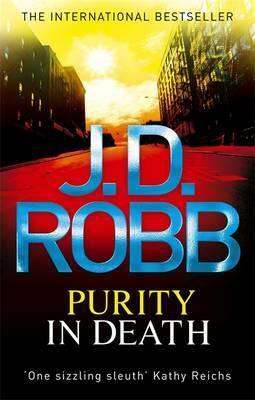 #15 in the series - Purity in Death was another excellent addition to the series. I have planned a few to read this year, not quite one a month but near enough! How interesting! A computer virus that spreads to humans -- it's just a matter of time. Eek! I'm glad you enjoyed it. I should give this series a try. It's very good. Yes I know, not beyond the bounds of impossibility I guess!